So, I've been picturing the U.S. Olympic team downing bowls of Congee in the morning. Unless, that is, they've imported boxes of Wheaties for the occasion. Then, I noticed this article in the San Francisco Chronicle. 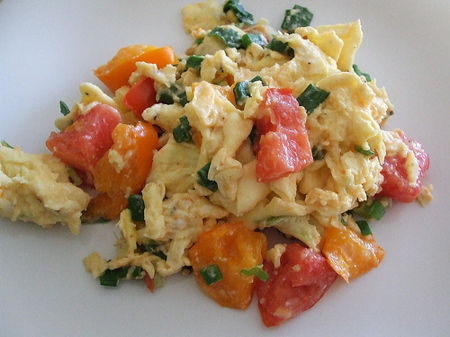 Apparently, scrambled eggs and tomatoes aren't uncommon breakfast fare in the Middle Kingdom. Add some requisite ginger and green onion, and it's suddenly a morning meal in Asia. Not bad. And, definitely more warming than Wheaties. Gramercy Tavern is a civilized spot. Lunch -- whether for business or pleasure -- may not require a Martini, but in the name of being civilized, a glass of wine is most certainly in order. 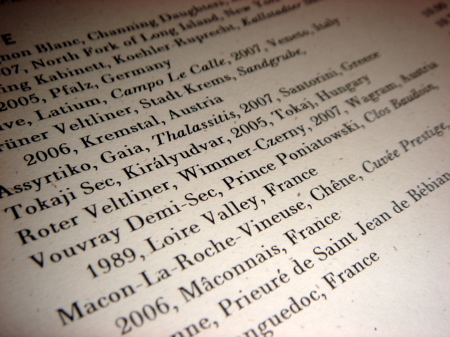 In this case, my lunchtime vino order was a bit of a surprise. A wine I'd never tried before. Roter Veltliner. A more full-bodied, kissing cousin of the popular Gruner Veltliner, it was the perfect sip and swirl to start off an important business luncheon. 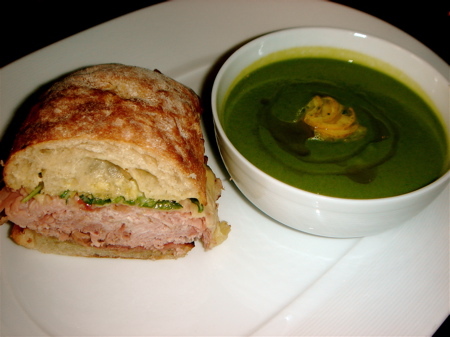 Then, came the bargain -- an off-menu soup and sandwich option. Chilled Zucchini Soup with a drizzle of Curry Oil and a warm Ham Sandwich piled high with rosy pink slices, a handful of crisp greens and slathered with a homemade aioli dressing. The kicker? The cost. Thirteen bucks. The real kicker? The picture above is only HALF of the Gramercy Tavern soup and sandwich portion. My lunch companion and I split the order. What can I say? I guess those Restaurant Week lunches are for suckers. Would You Like An Entree With Your Entree Into The Art World? Galleries are great. But could the hottest new scene in the art world be bypassing West Chelsea dealers for the heat near the kitchen? For example, artist Alice Lipping had a showing at an upscale Flatiron cafe, which in turn led to a sighting by a representative from a high-tech company in Japan and a major corporate sale in Osaka. A restaurant employee of Chef Tom Colicchio for the past 11 years, after the Osaka sale, her paintings finally caught the notice of her "Top Chef" boss. 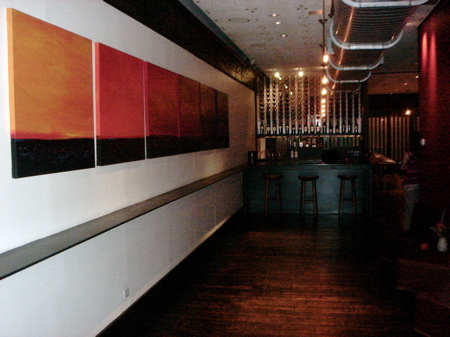 Now Colicchio has hung a collection of Lipping's acrylic and mixed media works in the entryway to the private dining room at Craft -- offering them for sale by the artist. To top it off, an exclusive party is scheduled for Monday, August 18th to celebrate this color spectrum series (pictured above), introducing Lipping's pieces to art aficionados, collectors and restaurant world bigwigs. If all goes well, Colicchio may lose one of his favorite Craftsteak servers, but gain kudos for discovering a sought-after, up-and-coming artist. Does this mean more artists will be looking to chefs and restauranteurs for patronage and a meaningful introduction to the art world elite? Even if the strategy doesn't pay off, at least they won't end up as "starving artists." At one time I had hope for the far north stretch of Henry Street. Busy Chef was a nasty hodgepodge of bad baked goods and pathetic pre-packaged sandwiches. 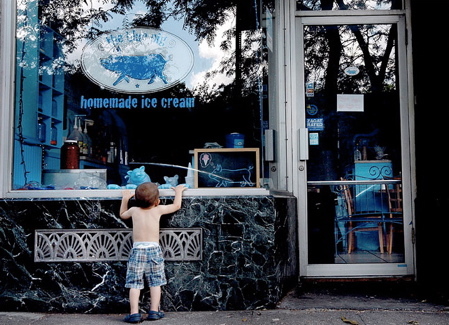 The ice cream at Blue Pig may have been popular with kids, but it was no better than Breyer's with freezer burn. The pizza at Oven tasted more like it was from South Dakota than South Brooklyn. The Wine Bar at 50 Henry was passable, but only after you'd had one or two proper drinks somewhere else first. Which always led me to wonder: How can the guy who owns all these places make a living selling this crap? ..On July 17, Mr. Kaufman was arrested and charged with grand larceny, falsification of business records and identity theft, according to the Brooklyn district attorney’s office. Based on evidence collected by employees and investigators from American Express and Citibank, he was accused of using the credit card numbers of 19 customers to steal nearly $25,000 during the past six months, and attempting to steal an additional $46,000 from five other patrons, according to court papers. And with that, the saga of "the cursed corner" continues. 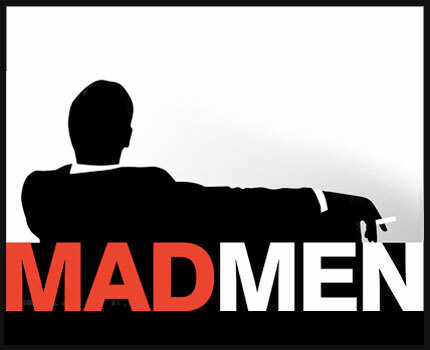 Best moment in this evening's episode of the hit show Mad Men? The debonair Don Draper instructing his little daughter on how to make him a proper Tom Collins before she's shuttled up to bed to allow the adults to savor their drinks. It all makes me wistful for a simpler era: One in which an elementary school child would know their way around a shaker and Martini glass. 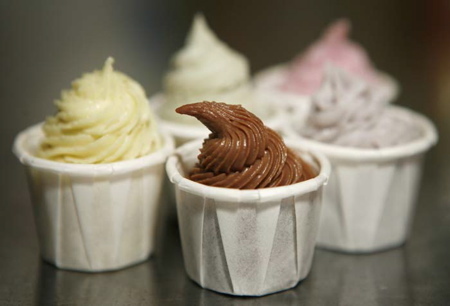 The bake shop boom that has fueled the oh-so-retro love affair with cupcakes has spawned a new – albeit micro – trend that has Saturday-night hipsters doing a new style of shot that won't burn your gullet like 150 proof. When it comes to shots, I think I'll stick to tequila for the time being.